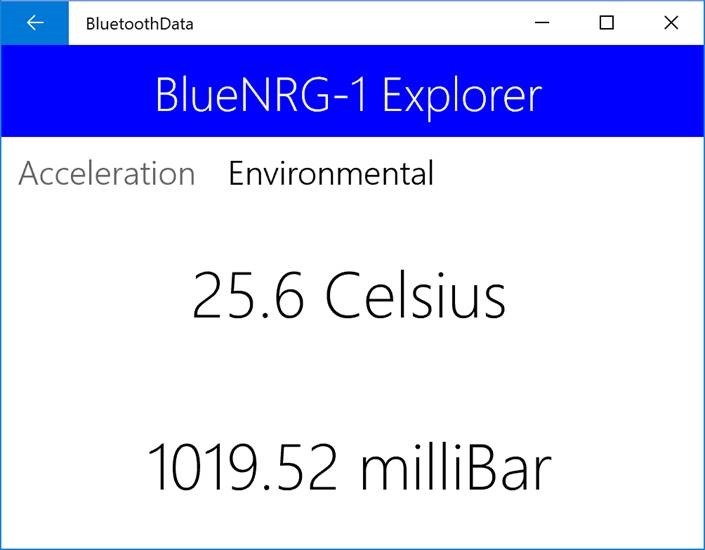 Universal Windows Platform supports really great Bluetooth API that allows us to build applications that are connected to various kinds of wiring devices. 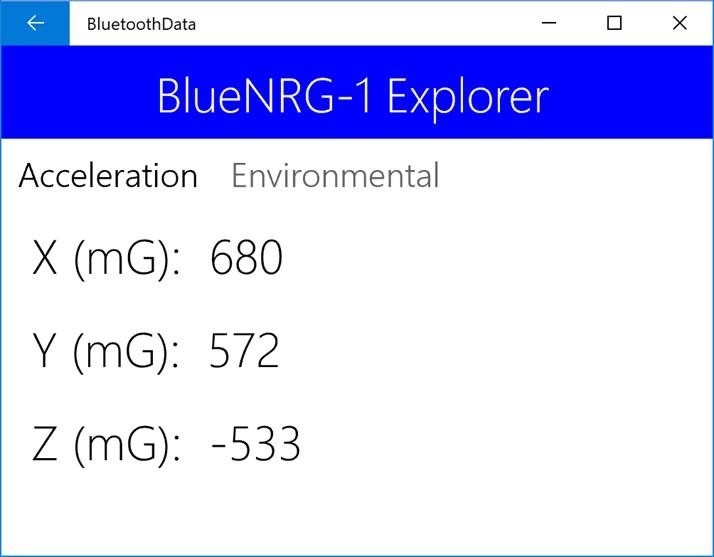 Your application can support Bluetooth LE (Low Energy, 4.x version) or even previous versions of the protocol, and I am going to cover how to use all of them, but let’s start with Bluetooth LE. In order to build couple samples, I would recommend to use any BLE development board. The board should contain several sensors and a preinstalled example. 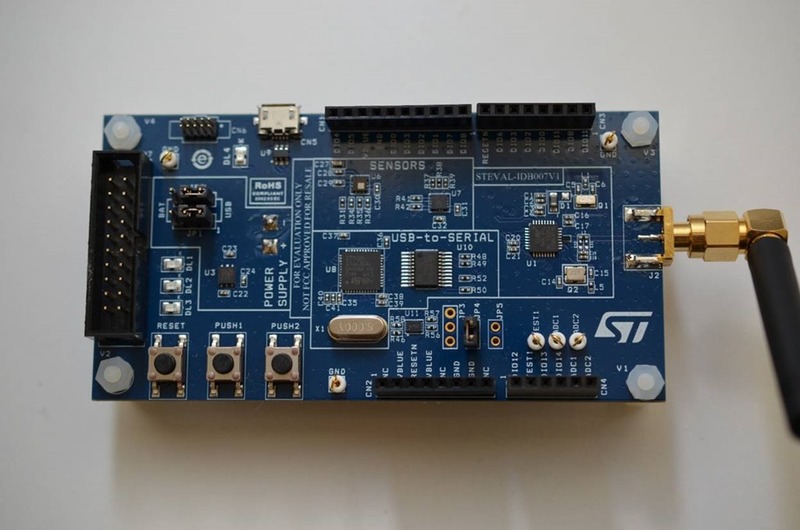 In my case I have an evaluation board from STMicroelectronics (STEVAL-IDB007V1) based on BlueNRG-1 Bluetooth chip. This board contains a 3D digital accelerometer, a gyroscope (preinstalled example doesn’t return data from gyroscope by design) and a pressure sensor with an embedded temperature sensor. All these things we will be able to use in our application. In fact, you can use any BLE device like a smart bulb that you can buy in Home Depot, but prior to buy anything you need to make sure that there is a document that describes all services and characteristics. Of course, using UWP API you will be able to read all available characteristics, but in the case of “no name” devices it’s really hard to understand how to interpret incoming data. Universal Windows Platform contains five namespaces with Bluetooth keyword including Windows.Devices.Bluetooth. 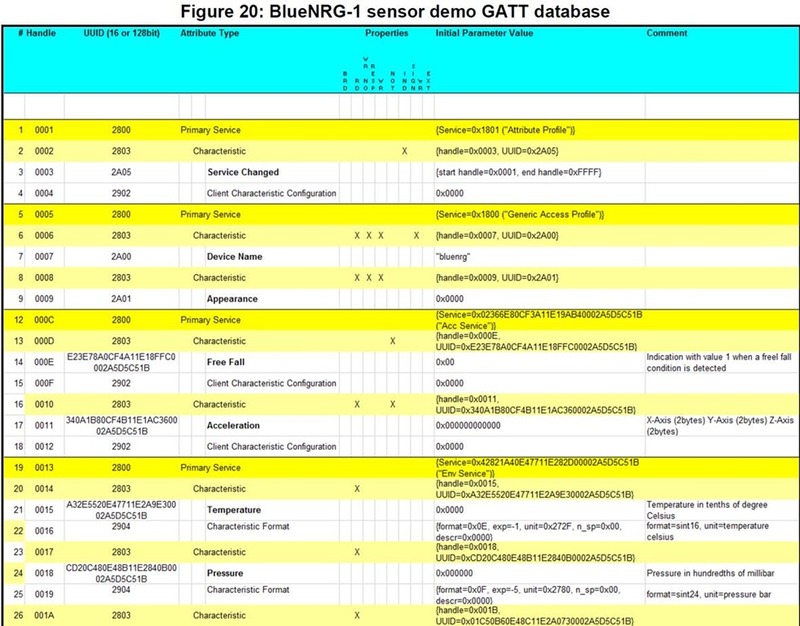 Exactly this namespace contains the BluetoothLEDevice class that will help us to get information about all available services and characteristics. But prior to start creating any instance of this class we need to implement interface that will allow a user to select our device from the list. Of course, we can list all device in code and connect to any of them without any interaction with the user, but it’s always better to get confirmation from the user. The dialog support DeviceSelected event that helps us to understand which device is selected. Alternatively, you can use PickSingleDeviceAsync method to avoid any event handlers. You can see that DevicePicker can display any devices. So, in order to display just BLE devices we need to setup a filter using Advanced Query Syntax string. ADS can be a little bit complex to setup. That’s why we used the BluetoothLEDevice class to get access to some predefined strings. Using the GetDeviceSelectorFromPairingState method we can return all BLE devices that are paired or non-paired. Adding both strings to the filter, we can select all available BLE devices. You can see that in order to create the watcher, we used the CreateWatcher static method that you can find in the DeviceInformation class. This method accepts several parameters. Using the first one we can provide a filter that can help us list just needed devices. It’s the same Advanced Query Syntax string that we used before, but in this case, we created it from scratch rather than using a predefined one. 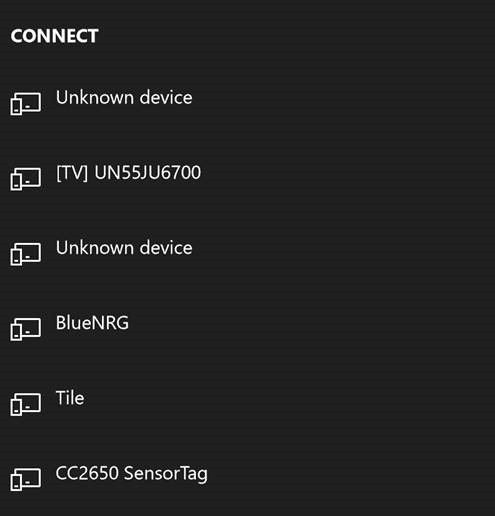 It’s a good idea to show different approaches and I used a filter that helps me find exactly devices that contain BlueNRG string in their names. To implement this filter I used the System.ItemNameDisplay property. Because all my dev kit is available as BlueNRG by default, my application will show just my device. Of course, we should not hardcode any names and it’s better to use less restrictive filter like we did in the first block of codeIf you want to find more information about possible ADS properties you can visit this page. The second parameter is a set of properties that should be available for a device. In this case we requested DeviceAddress and IsConnected properties, but I used it just for the demo. I assume that you will not able to find many different devices with BlueNRG name around, so, you can simply remove this parameter. Finally, we have to pass the DeviceInformationKind flag. In our case it should be AssociationEndpoint that is true for all Bluetooth LE devices that advertise their interface. Looking at this table we can note service UUIDs for Acceleration, Temperature and Pressure. It’s exactly that I am going to display in my application. Potentially we can check Free Fall, but I have just one board, and I will try to avoid any scary experiments. Pay attention that Bluetooth LE standard contains some standard profiles that can help you recognize some standard services. Profiles, it’s something that operating system uses to connect any Bluetooth mouse or stream video/audio between different devices (not BLE, but the idea is the same). In some case you will need to rely on standard profiles, but in some cases, you can create your own. Looking at the table below you can see that our development board implements standard attribute and generic access profiles. Thanks to them Windows can read some information about the device like device name. But all other services implement custom profiles. It’s ok if your device is not going to support any standard feature and it can be a problem for you if you want to connect some low-cost Bluetooth devices to your application. I found that lots of devices from “no name” companies implement own custom profile and if you want to connect your phone or tablet to these devices you have to download an application. But once you want to create your own application, it’s really hard to find how the device works. Ok. Now we know where to find information about supported services and characteristics, but we still didn’t finish our main page. So, let’s do it. The collection should be observable because we are going to bind it to our interface and it should track any changes dynamically. You can see that we use the handlers to track changes in the list. Pay attention that both handlers are running in non-UI thread. So, we have to invoke dispatcher to modify our collection. Pay attention that our device is still not paired, but in order to start reading data from it we should not pair it. This feature is available since Windows 10 Creators Update. All previous UWP versions requires pairing prior start reading any data. In general, the most important method in this class is ReadValue, but BLE supports notification mechanism. From the GATT table, we can see that our board supports at least one sensor that allows us use notifications to receive updated data. This is accelerometer sensor. Of course, I could read data from accelerometer using just ReadValueAsync method, but I wanted to show how to use notifications. It’s not always true that your device will send updated data several time per second and in this case notifications allows to save some time, avoiding not needed queries. You can see that in order to enable notification for a characteristic we simply have to add a special descriptor using WriteClientCharacteristicConfigurationDescriptorAsync method. Once the descriptor is assigned, we will be able to receive messages with new values for the characteristic. Pay attention that by default our sensors don’t use notification mechanism. So, if you want to enable notification for accelerometer, it’s needed to call EnableNotification method. You can see that we simple list all available services and once we found needed service we initialize appropriate sensor. This code should work even if you select a wrong device from the list of all BLE devices. The user interface will simply display nothing. Because two of our characteristics don’t support notifications we will simply use a timer to update the UI once per second. Now, you know how to connect your application to any BLE device and get data from there. At the same time, we didn’t pair out device. Let’s see, how to use Bluetooth API to implement pairing and get some benefits from there. I am studying BluetoothLE. And then I looked at the data and then I saw the blog. Can you give me some advice if you can’t help me? Studying the example source of BluetoothLE in Windows 10 Universal Windows:Character_ValueChanged () does not respond to the Characteristic function. In the example source, the value change is called a function recall, but it does not respond to WinForm. I have encountered exactly the same issue! And after hours of surfing and googling i actually fund out, that this is a known bug in Windows10. But not in all Versions of Windows10, but at least in my Version 1709. The notify Event will not raise very poor from Microsoft that they still haven’t fixed this bug. Congratulations for this article… great work.